So you’re thinking of buying a home in Texas—congratulations! Between Texas mortgage payment calculators, reality agreements, and FICO scores, there is a host of information to process as you make your home ownership dreams a reality. Getting a mortgage in Texas is easy – if you follow these tips! Buying a house is an exciting and nerve-wracking time, but these 5 tips will take the mystery out of the Texas mortgage process. Before you jump into a mortgage in Texas, you need to be aware of your own finances and how they stack up against Texas mortgage requirements. There are three numbers that potential home buyers should know: their credit scores, debt-to-income ratio, and down payment amounts. The minimum credit score typically needed for a mortgage in Texas is 620, which puts you squarely in the “fair” category. However, mortgage lenders will often see borrowers with credit scores under 700 as riskier applicants. You can raise your credit score over time by making timely payments, keeping your credit utilization low, and paying off debt. Mortgage lenders want to make sure that you make enough money to repay your mortgage. A DTI ratio of 43% is usually the maximum allowed for borrowers who hope to secure a mortgage, but a lower DTI is better. To calculate your DTI, add up all your monthly debt payments. For example: $500 (auto loan) + $250 (student loans) + $100 (credit card minimum) = $850. Pay off some debt to reduce your monthly payments, and you will be more likely to be approved for a mortgage. For a conventional mortgage, lenders typically prefer a 20% down payment. Putting down 20% means that you won’t pay Private Mortgage Insurance (PMI), which will reduce your overall mortgage payment. While average homes in Texas are reasonably priced, saving a 20% down payment is just not feasible for many would-be home buyers. If you don’t quite reach this hefty down payment requirement, there are some Texas-specific assistantship programs that can help you make homeowner ship a reality. You might also try speaking to a mortgage lender to determine whether you qualify for an FHA loan or another loan type that allows you to make a down payment of as little as 3%. In addition to making sure you have an adequate down payment and a healthy credit score, it’s essential to examine your budget before you buy a house in Texas. A good starting place is look at a mortgage payment calculator. There are Texas mortgage payment calculators available online, but you should verify that they are calculating the correct property taxes for your city, PMI rate, and any HOA or insurance fees. While your mortgage lender will give you an official breakdown of your payments when you take out a mortgage, it is always a good plan to calculate how much home you can afford before you start searching. It is best to get pre-approved for a mortgage before putting an offer on a home. Sellers will be more attracted to buyers who can demonstrate their credit worthiness and financial commitment to purchasing a home, and buyers with mortgage pre-approval can feel more confident in their offers. Finding a trusted mortgage lender at this stage is crucial. While there are many self-service mortgage companies available online, working with a mortgage professional in person can facilitate the process from pre-approved to full approval, and can be improve the purchasing process. Real estate websites make it easy for would-be home buyers to contact the listing agent for any property and set up a showing. However, you should choose your real estate agent as carefully as you choose your mortgage lender! When you start looking to buy a house in Texas, you should also look closely at local real estate agents and pick someone with a good reputation. Just like choosing a mortgage lender, you want to go with someone who will look out for your best interests in this process. In Texas, home sellers must fill out a Seller’s Disclosure Notice in addition to many other forms. This disclosure notice informs potential buyers about any problems with the home that the current homeowner is aware of. While legally this disclosure must be completely honest and transparent, before buying a house in Texas it is a good idea to hire a private home inspector. Homeowners may not be aware of an upcoming problem or could have forgotten to list something on the disclosure form. A home inspection is one of the best ways to protect yourself. We can’t emphasize enough the benefits of knowing your financial situation before jumping into a mortgage. Consulting a mortgage calculator and being aware of key financial details (your credit score, DTI, and budget) will help with the pre-approval process. The next step of the process is finding a trusted mortgage professional to help you move through the pre-approval documents, provide accurate mortgage payment calculations, and process the paperwork to secure your mortgage. Once you find your dream home, it’s important to make sure that you protect yourself by reading the seller’s disclosure notice carefully and hiring a private inspector. Huge issues, such as a faulty septic system or a leaking roof, can be cause to walk away from a purchase or can give you room to negotiate the price of the home. Real estate and mortgage professionals are here to help you, but you should always do your research before buying a house in Texas—or anywhere else, for that matter. If you ever doubt that your real estate agent or mortgage professional has your best interests in mind, reevaluate the situation. Purchasing a home is a life-changing decision, one you should make with careful planning and trusted professionals by your side. Sponsor: United Fidelity Funding Mortgage is a multi-state, direct mortgage lender that offers low fees and mortgage rates. With no overlays and no regional or national marketing budgets, UFFM keeps costs low and passes the savings on to their customers. 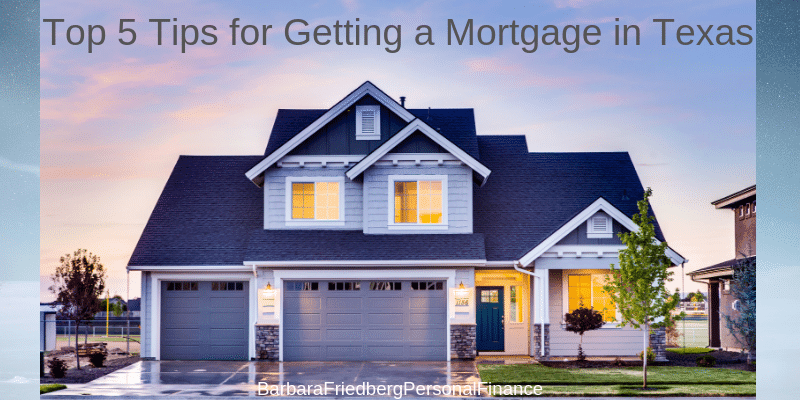 The post 5 Things You Should Know Before Getting a Mortgage in Texas appeared first on Barbara Friedberg.